Rated: PG-13 for intense sequences of sci-fi violence and action. It’s still summer, and “Captain America” is a summer superhero movie if there ever was one. It takes us to a 1940s America where the little guy can achieve beyond his wildest dreams, and where good people can destroy evil with tenacity, luck, and a strong jawline. Steve Rogers (Chris Evans) starts the movie as a ninety-eight pound weakling. CGI wizardry takes the tall, muscular Evans and turns him into a short, scrawny kid who looks as though a strong wind might push him over. He tries to get into the army to go fight in WWII, but keeps getting turned down. He’s spotted during one attempt by scientist Abraham Erskine (Stanley Tucci), who offers him a chance — if he volunteers for an experimental program. After a montage of Rogers failing or falling behind during every test of physical ability but trouncing the other candidates in smarts and self-sacrifice, Rogers is chosen to have the procedure done — the procedure which turns him into a tall, heavily-muscled, and improbably fast version of himself. At first, the government wants to use him as a propaganda tool, and ships him around the country selling war bonds and pretending to punch the daylights out of an actor dressed as Hitler, while a line of star-spangled chorus girls coo. Of course, we in the theater know he is destined for greater things, and it doesn’t take long for him to be on the ground, fighting a threat even greater than Hitler: HYDRA, led by Erskine’s first test subject for the serum, the power-mad Johann Schmidt (Hugo Weaving). The rest of the film is a rip-roaring ride through combat sequence after combat sequence, with occasional stops for low-key character development. Weaving chews just the right amount of scenery, especially once Schmidt’s true face is revealed and he steps into his identity as the Red Skull. There’s lots of heroic behavior and daring escapades. What makes “Captain America” and its CGI-heavy effects work is that the filmmakers wisely don’t dwell on the special effects shots. CGI is pretty obvious even at the best of times, and long, loving views of it showcase the tech and its limitations rather than propelling the story forward. That mistake doesn’t get made here, and the film is greatly improved by it. It’s especially effective with the Red Skull, whose look in this film was simply not possible a couple of years ago. The almost seamless blending of Weaving’s actual face and the CGI-created effects is impressive. There are moments when the CGI isn’t quite up to snuff, but they pass quickly and are easy to forgive. There are references to other films in the Avengers franchise, including use of some alien tech related to the Norse gods and a medium-sized part for Howard Stark (Dominic Cooper), whose son Tony is better known as Iron Man. It gives the film the right flavor, and whetted my appetite for the big, bring-it-all-together movie coming next year. 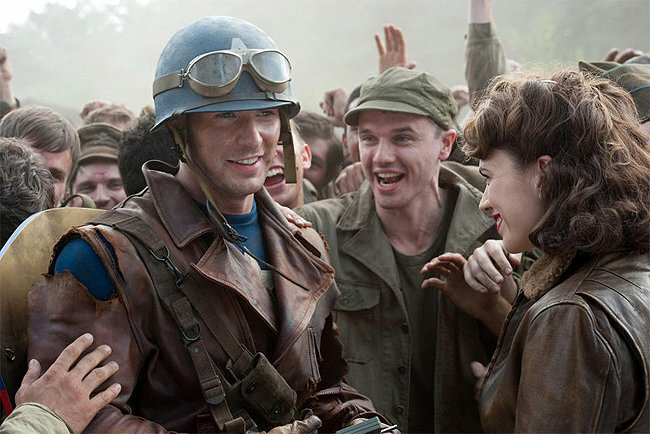 The film’s design is in a slightly different style than the other Avenger movies have been, colored strongly by the visions of the future and the patriotic designs popular in the 40s. It works really well, and never crosses over into jingoism or self-parody.